Tracy E. Fulton, Sammons Center Hall of Fame. Tracy served as president of the Sammons Center board of directors from 2005 to 2009 and helped the organization overcome a pivotal fundraising challenge. Founder of the popular Sammons Cabaret series in 2012, Tracy continues his roles as co-artistic director and master of ceremonies. An executive vice president with Tolleson Private Bank, Fulton recently served as the Center’s treasurer and chair of the programs committee. The “Sammons Center Hall of Fame” award is the highest honor given by the Sammons Center for the Arts. TurningPoint Foundation, Benefactor of the Year. Established in 2005, TurningPoint Foundation has generously supported the Sammons Center beyond the usual and customary. Their partnership, investment and personal involvement has made an incredible impact. Led by founder and president Molly Byrne, the foundation contributes to numerous arts, education, and community health causes. 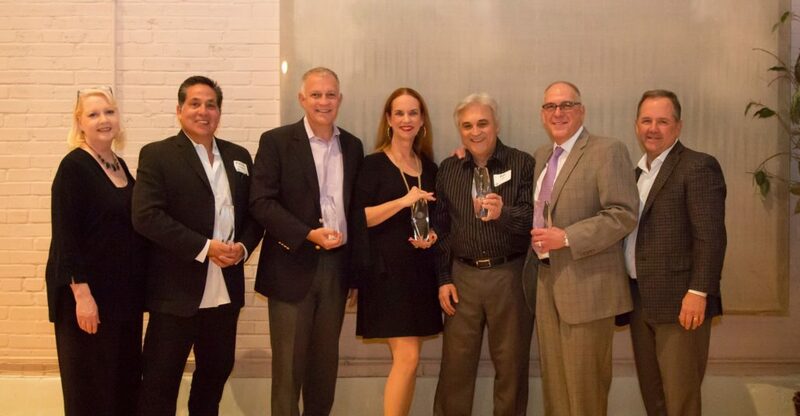 Dallas Door Designs and Patrick Antognelli, Sammons Jazz Benefactor of the Year. Established in 2012 by jazz enthusiast Patrick Antognelli, Dallas Door Designs is a family-owned and operated firm serving commercial and residential customers across the nation. Offering a wide range of custom door styles and designs, the company sponsors the Center’s renowned Sammons Jazz series. Bill Lohr, Sammons Jazz Artist of the Year. An accomplished pianist who began his career in his native state of Virginia, Bill has accompanied noted singers such as Al Jarreau and Lou Rawls on worldwide tours and TV appearances. When he is not teaching, Bill and his vocalist wife, Peggy Lauren, perform throughout the DFW area. Carolyn Lee Jones, Sammons Cabaret Artist of the Year. After a successful career in luxury retail, the next natural path for Carolyn Lee Jones was as a vocalist and bandleader. Whether hearing Jones live or recorded, her audiences and critics praise her rich, silky vocals, charming personality, and repertoire that covers everything from classic jazz to vintage pop. Craig Whipple, Volunteer of the Year. By day, Craig Whipple manages executive stock plans. Outside of work, he is a dedicated and friendly volunteer who enhances the patron experience at Sammons Jazz and Cabaret concerts. When not traveling, he also serves as a board member for the Dallas Summer Musicals Guild and volunteer at various theater companies in Dallas.